Here's a Valentine's Day floral arrangement that will make hearts flutter. 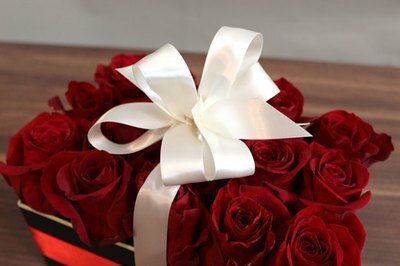 The arrangement is both an exquisite collection of roses and a gift box wrapped in a bow. Arranged in a low pavé style, the roses create the illusion of a flat rectangular box. This simple-to-make creation is the perfect centerpiece for a Valentine's Day gathering or a modern arrangement for that special someone. 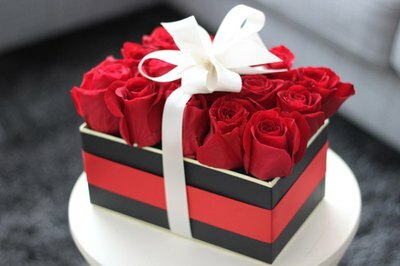 A shallow gift box will act as the arrangement's foundation. Only the bottom of the gift box is needed. You can purchase empty gift boxes at container or packaging stores, but better yet, upcycle boxes you might have in your own home. 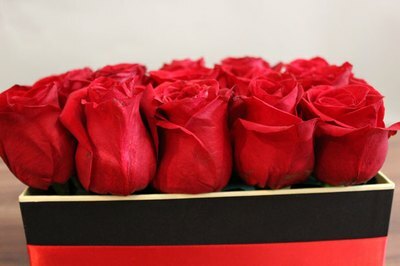 Just be sure the box is rigid and sturdy enough to support the weight of the roses and floral foam. 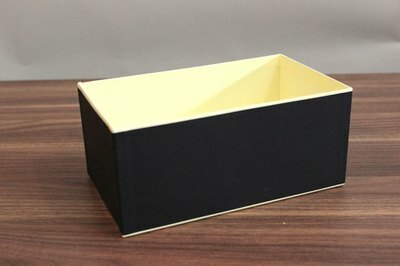 The box used in this example was actually a gift box for a candle. 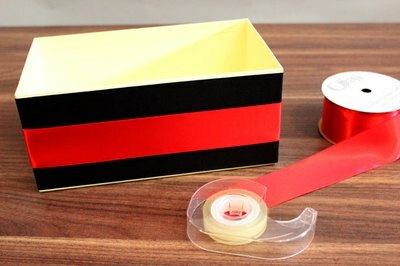 If your box is plain, like the black one pictured, wrap the outside of it with some ribbon. You can also wrap the box in decorative paper, but only place the paper on the outside, as it will get wet if it's on the inside. 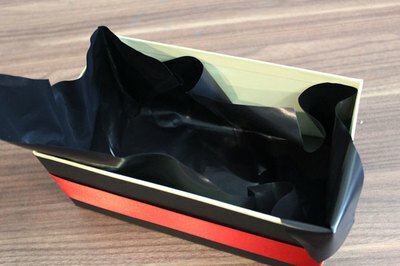 Line the inside of the box with plastic liner to protect the box from water. You can use a piece of a plastic garbage bag for this purpose, as long as you make sure there are no holes in it. 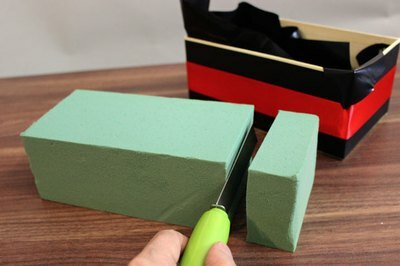 Cut a piece of floral foam so that it will fit inside the box. Be sure to purchase floral foam designated for fresh flowers rather than the foam for silk flowers. Floral foam is available in the floral supply section of craft stores. Soak the floral foam in water for about 15 minutes. 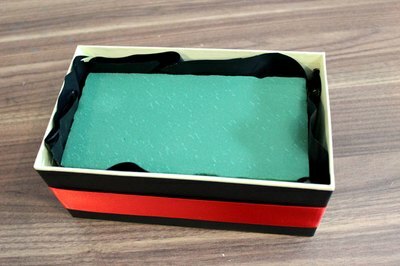 Place the wet floral foam in the plastic liner in the box. Cut off any excess plastic that is hanging over the box. 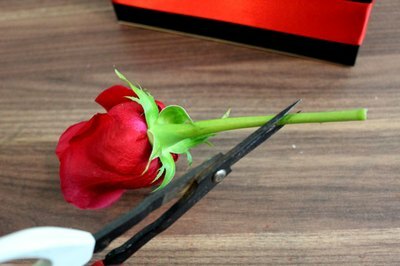 Cut the rose stems at a diagonal so there is more surface area for the roses to absorb water from the foam. Cut the stems to a length that is shorter than the height of the box. Remove the sepals – the five green points at the base of the petals – so they will not get in the way of the arrangement. 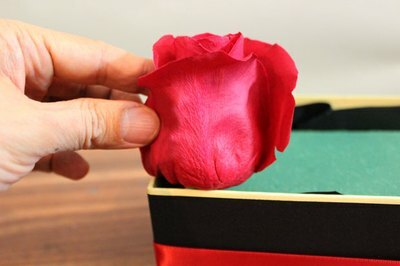 Starting at one corner, insert the stem of the first rose straight down until the bottom of the bloom just hits the rim. Be sure the rose is vertical and not at an angle to create the pavé-style arrangement, meaning the flowers are flat on one plane. Continue adding roses in a row, straight up and down. There should be an equal number of roses in each row. Look at the roses from the side to check that they are all at the same height and make adjustments as needed. 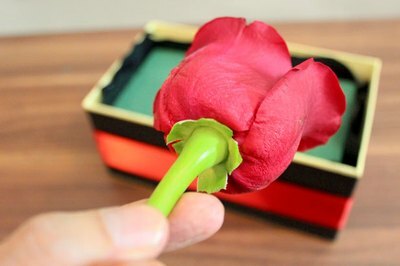 The number of roses you use will depend on the size of your box. This arrangement features 15 roses. 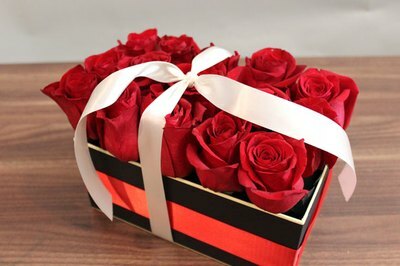 Wrap a ribbon around the roses and the box, as if the roses were the top of the box. If the roses are red consider a contrasting color, like the white in the example. Top off the flower arrangement with a bow attached to the ribbon. The bow can be taped or attached with a hot glue gun. This floral arrangement is also an ideal gift for birthdays and Mother's Day.